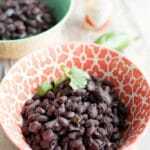 Mexican-seasoned black beans that come together in less than an hour in the Instant Pot - with no soaking required! Rinse the black beans and pick out any stones. Add all the ingredients into an Instant Pot and stir until well combined. Lock the lid, switch the pressure valve to seal and cook under high pressure for 25 minutes. Let the pressure naturally release for 20 minutes, then switch the pressure valve to release any remaining pressure. Stir. Drain to remove excess liquid. Add a little additional salt and a squeeze of lime juice if desired. If you don't want the Mexican flavor added to your beans, you can omit the onions, jalapeno, garlic and cumin. I promise, they'll be perfectly tasty, even without the extra seasoning.